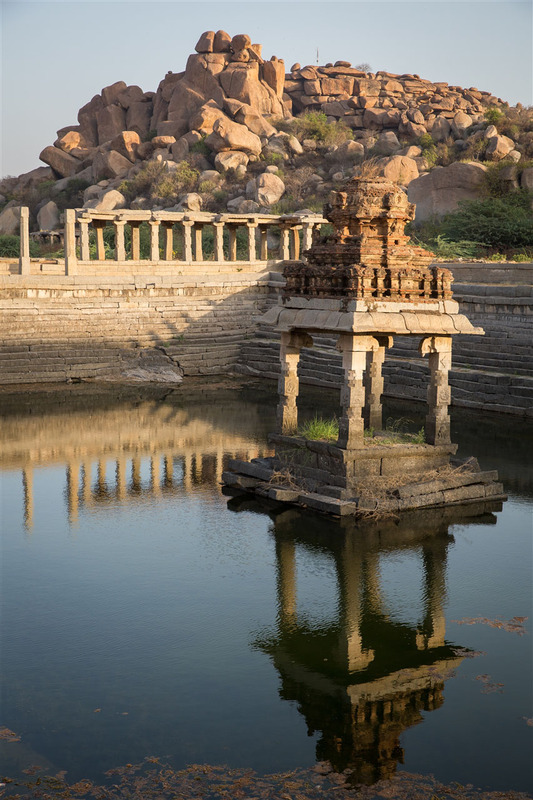 The superb Vitthaha Temple is likely to be many visitors favourite location in Hampi, and I can see why. 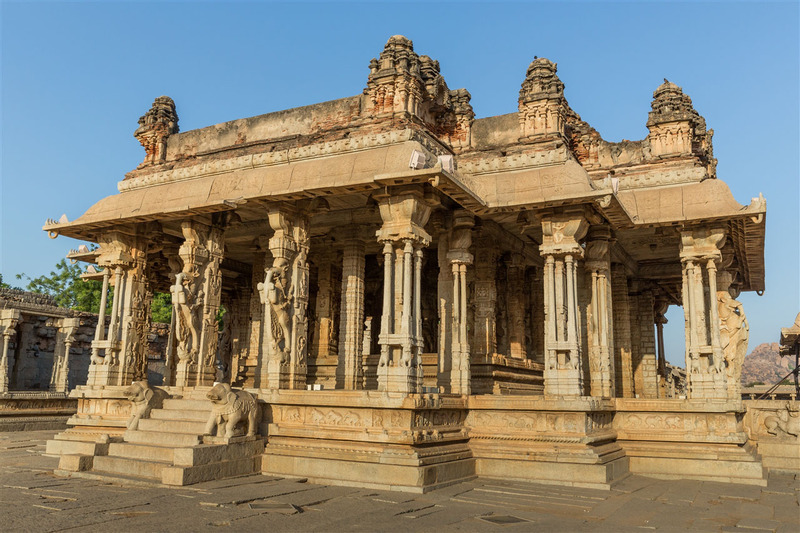 The temple is believed to have been built in the early 15th century, although some of the structures including the assembly hall date to the mid 1550s, but a decade before the defeat of the Vijayanagar empire to the Deccan sultanates. 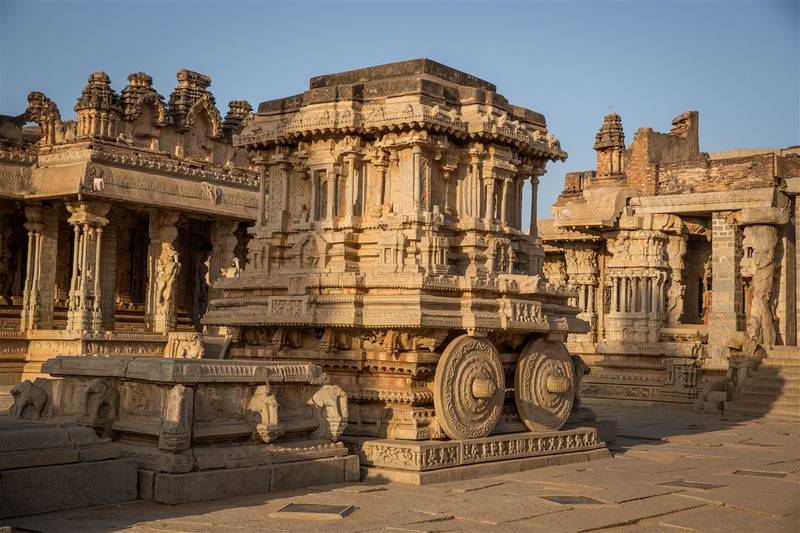 The approach to Vitthala Temple is via a colonnaded ceremonial avenue with roadside pavilions and a pretty water tank with a shrine at its centre. 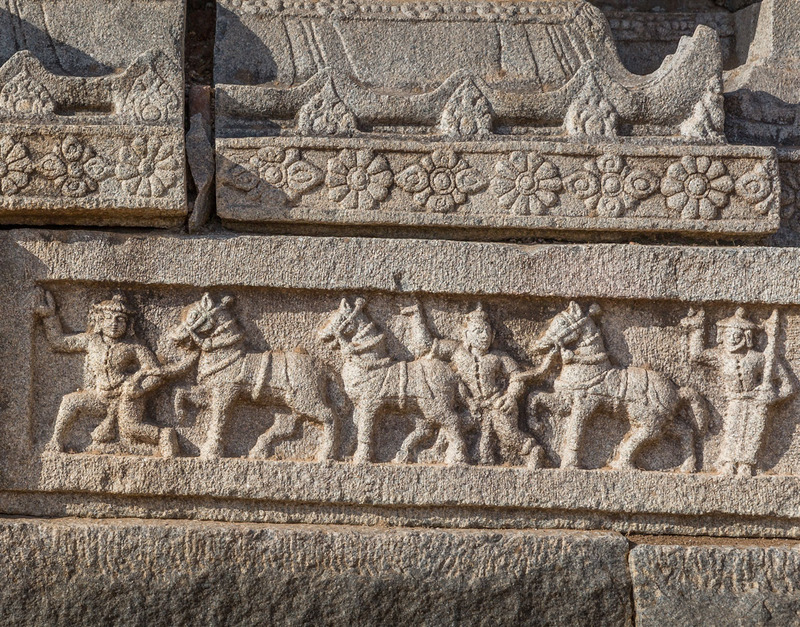 Already you get a glimpse of what is to come, with the amazing carved columns of Kuderegombe Mandapa depicting riders on horseback with the horses rearing up. 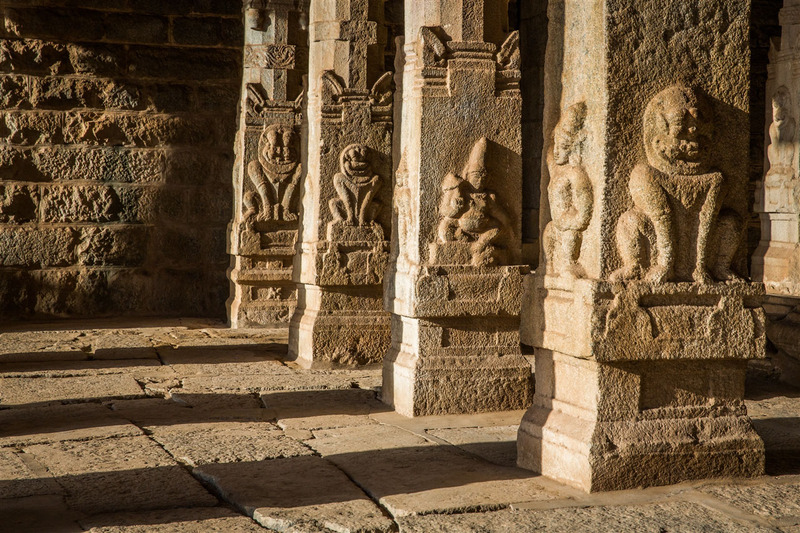 In the early morning sun, the deep light and shade really makes these carving pop out in photos. 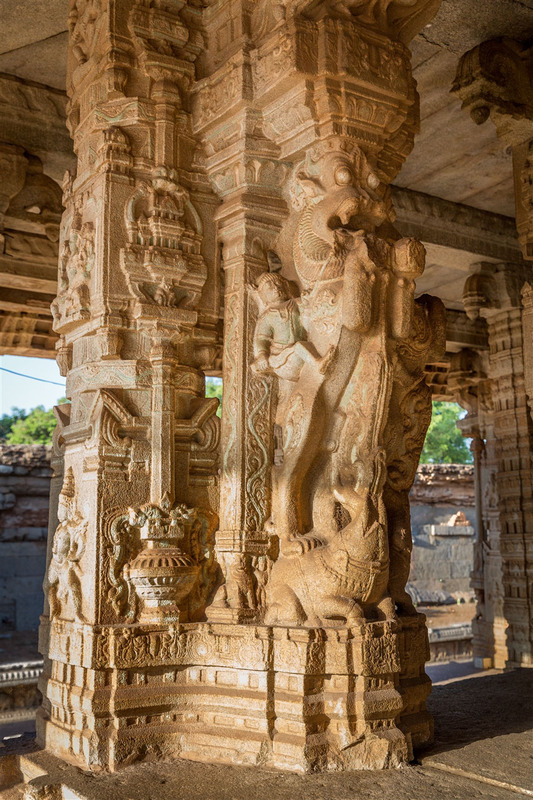 I arrived at the Vitthala Temple entrance super early in the morning, thinking that sunrise would herald the opening of the temple complex. 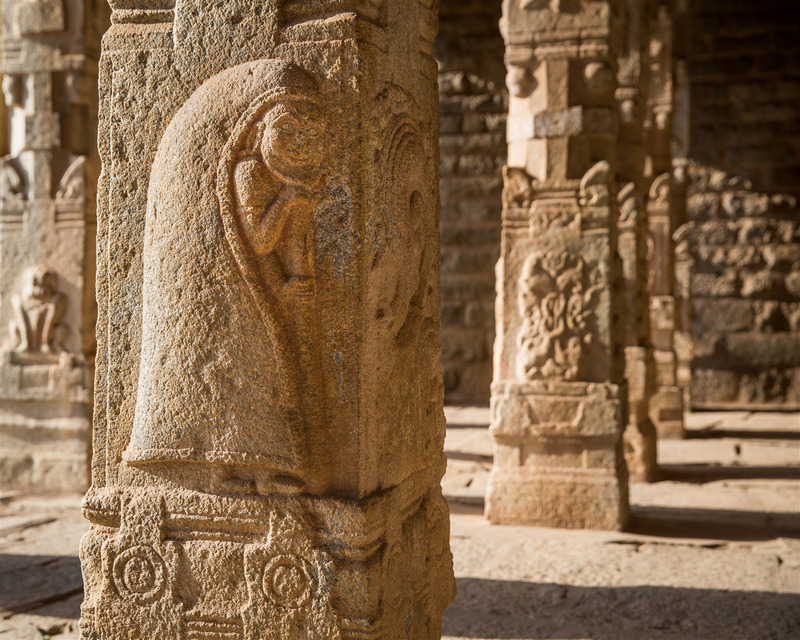 Luckily the guards let me in an hour before official opening, so I had the privilege of exploring the temple complex completely alone as the early morning rays starting to cast light on what is a feast of temple carvings. 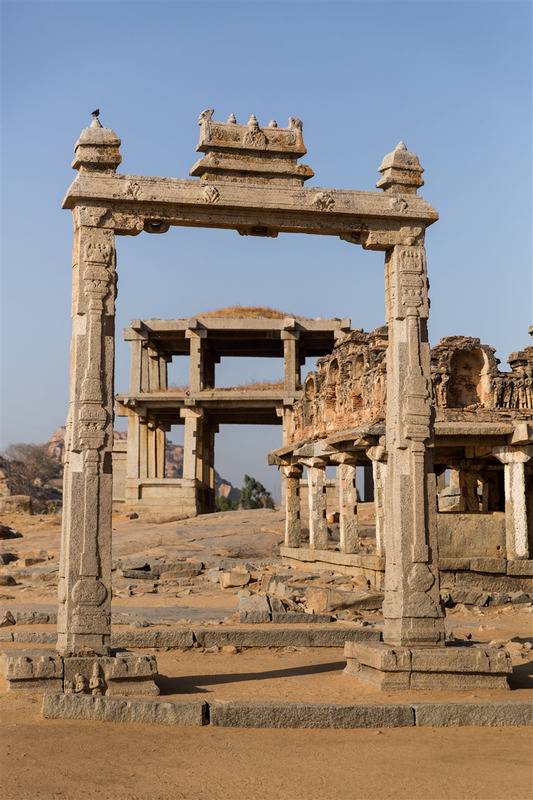 Having gone through the partially ruined gateway (gopura) you enter a large courtyard. 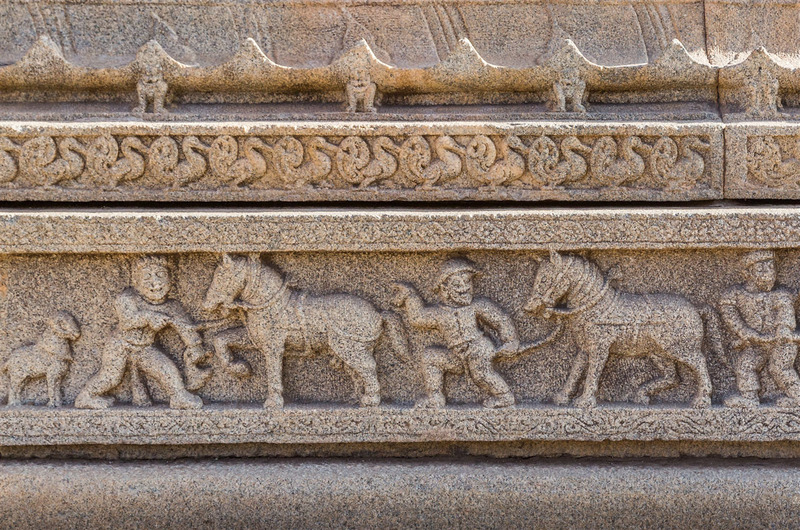 Immediately facing you is one of the most familiar scenes of Hampi, the stone chariot. 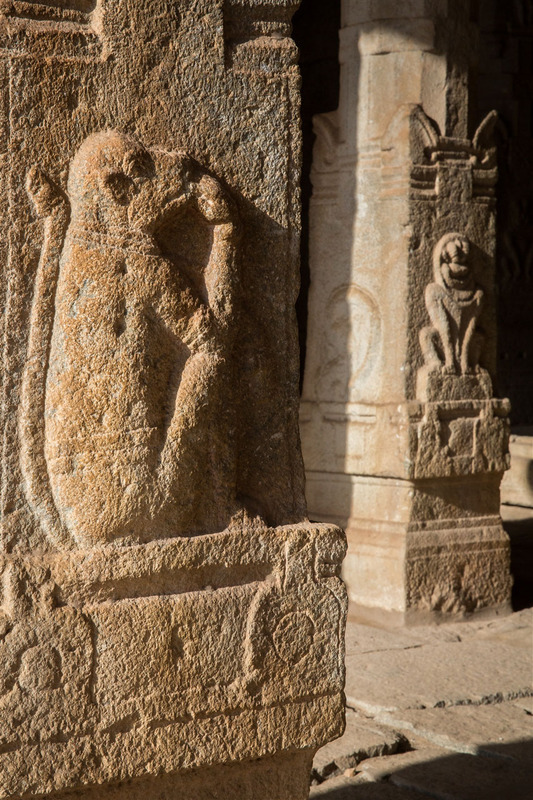 Dedicated to Garuda the eagle mount of Vishnu, with separately carved and detachable stone wheels, it originally had a brick and plaster superstructure which was demolished in the 19th century. 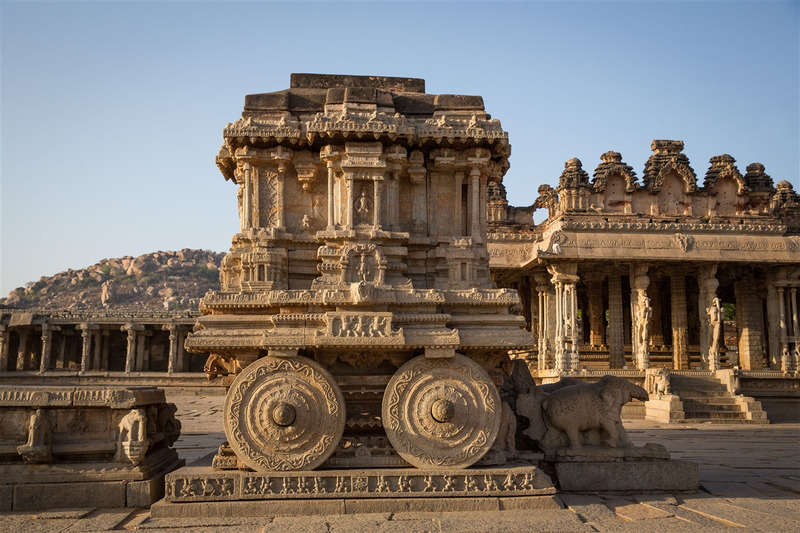 Behind the chariot are the three basic structures typical of Vijayanagara temple architecture; an ardha-mandapa (open hall with pillars), a mandapa (closed assembly hall), and the garbha-griha (inner sanctum for the idol). 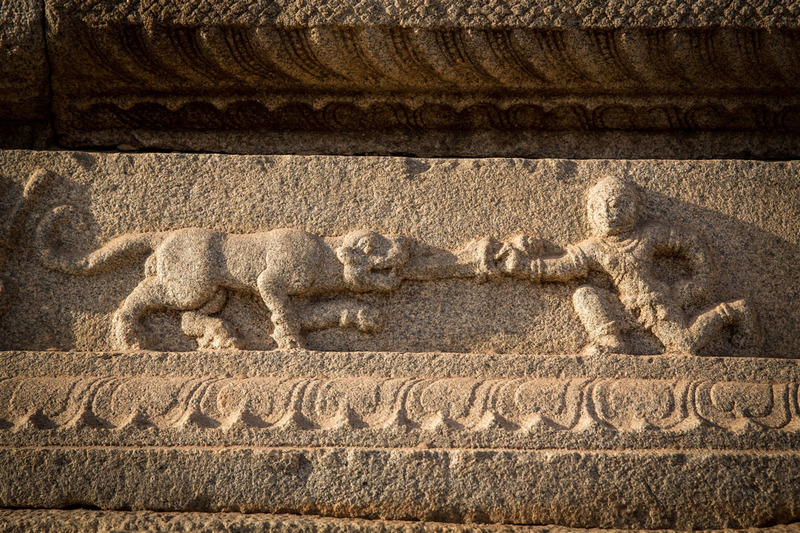 Everywhere you look there are remarkable carvings, not so much for the detail but the sheer amount of them. No column seems to be left untouched, and everywhere you look there’s a new image to be seen, and of course to be photographed ! 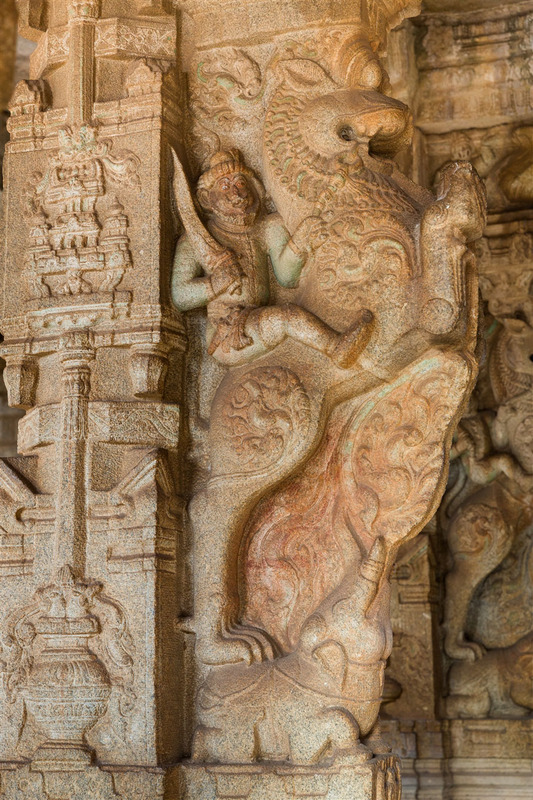 The leaping yallis (mythical beasts) are particularly fine, being ridden by humans who appear to be both in control and enjoying the ride. 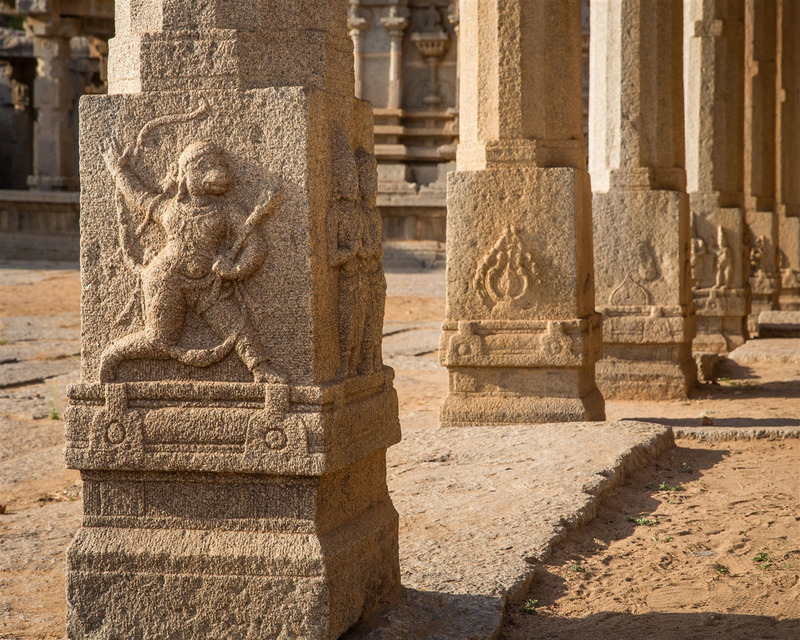 Although the yallis carvings may be repeated on many columns, the smaller carvings on the remaining sides of the pillars are ever changing. 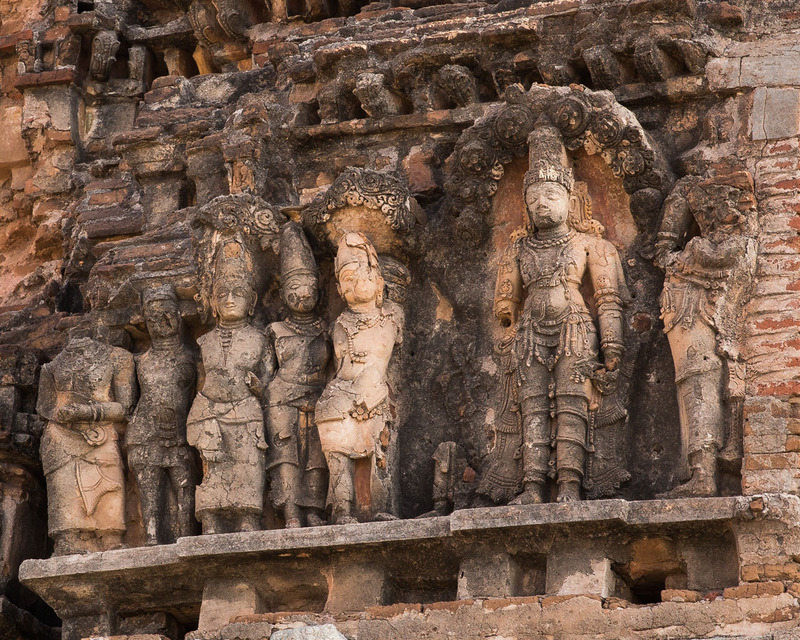 I wish I knew a bit more about Hindu mythology to identify some of them (perhaps you can help ? ), I’m sure these stones are trying to speak to me more than I’m able to listen, which is a great shame. 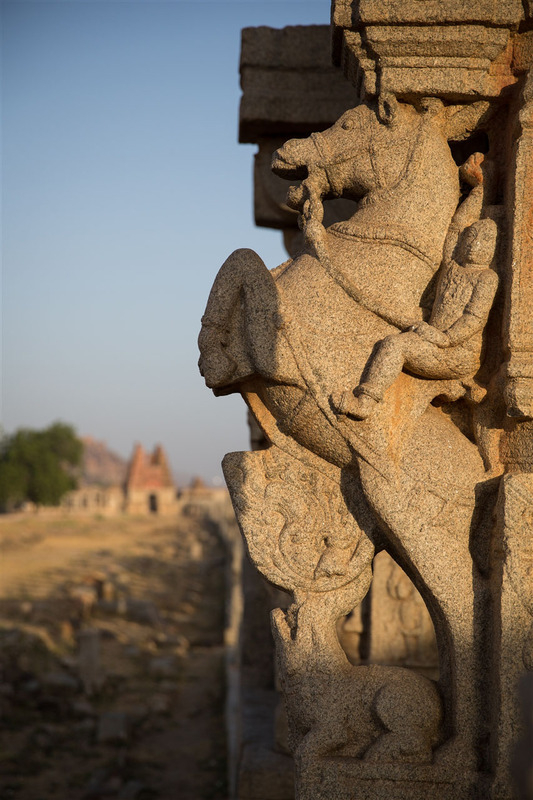 Around the base of some of the structures are interesting carvings showing Portuguese horse-trainers with European style hats and jackets, apparently they were in great demand in Vijayanagar (Hampi) in the mid 16th century. 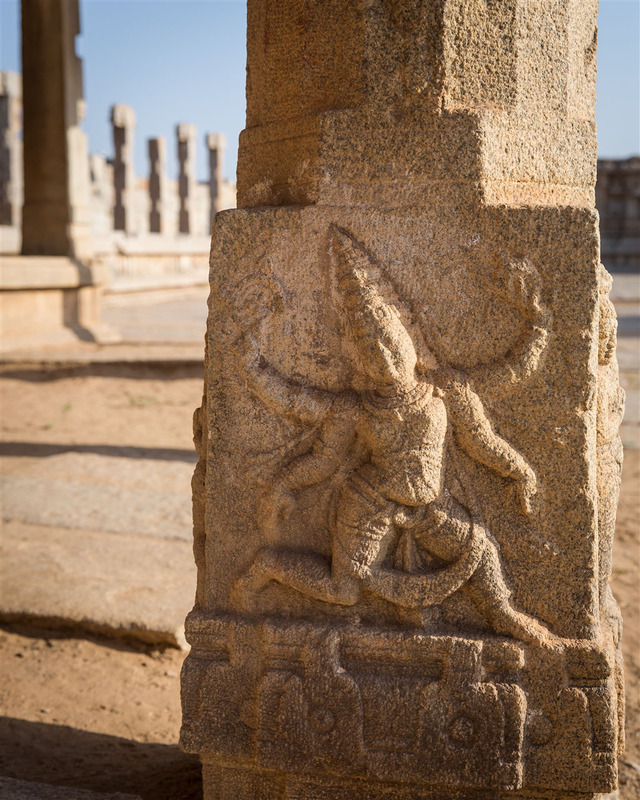 Behind the Vitthala Temple on the path towards Virupaksha is a gateway known as the Kings Balance. Note the stone rings on the underside of the cross beam. A chain once hung from here as part of a weighing mechanism. 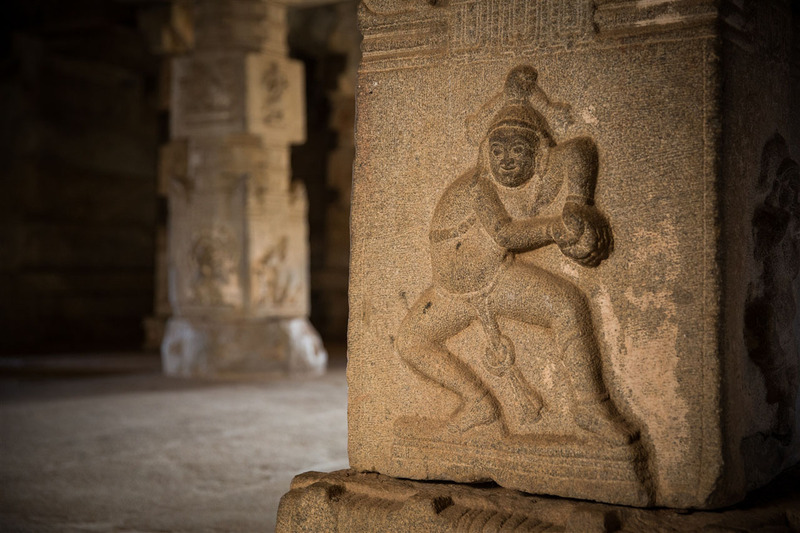 The city emperors are said to have been weighed on this balance, and the equivalent weight in precious stones was distributed to the temple priests. 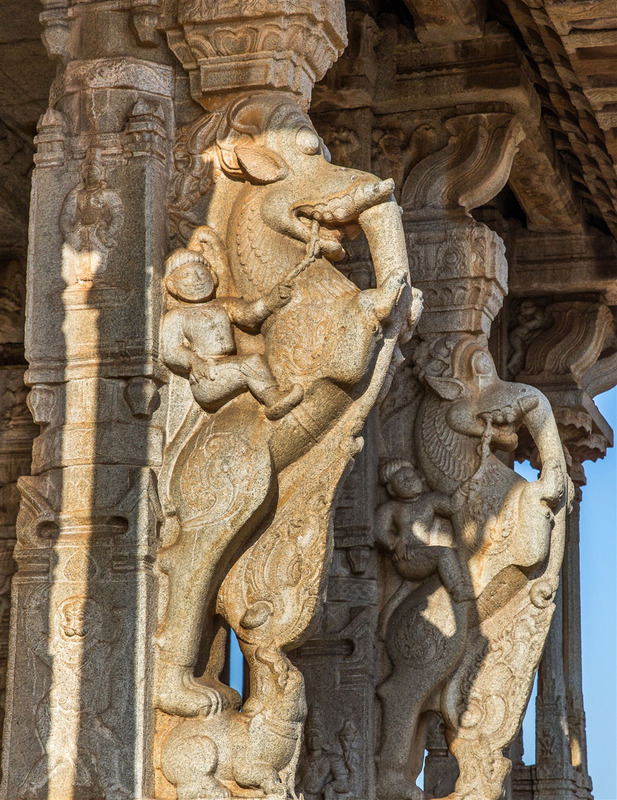 Beyond the Kings Balance is another two storey gateway, and from there the path winds it’s way close to the Tunghabhadra river past many more smaller shrines and on towards the Achutaraya (or Tiruvengalanatha) Temple. 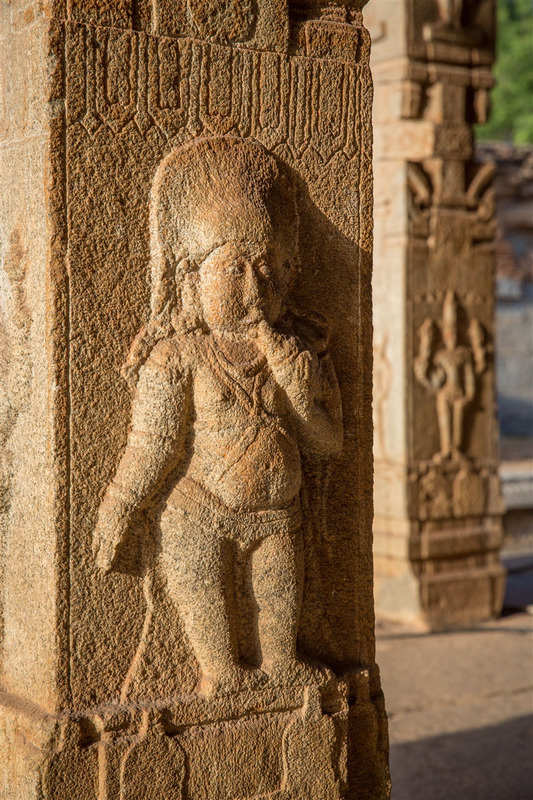 In my next blog I’ll take this route as I head back to the heart of the Sacred Centre. 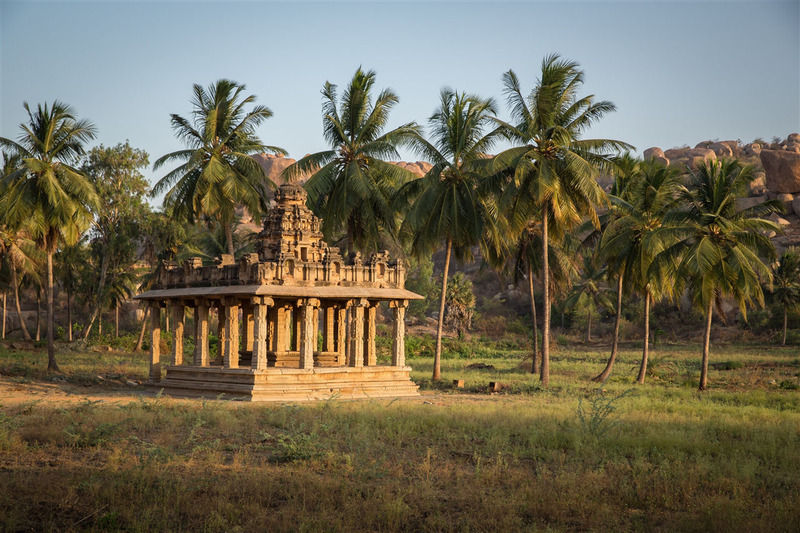 The Vitthala Temple is of course wonderful, simply breathtaking, both for the structures themselves but also the surrounding landscape that envelopes it. 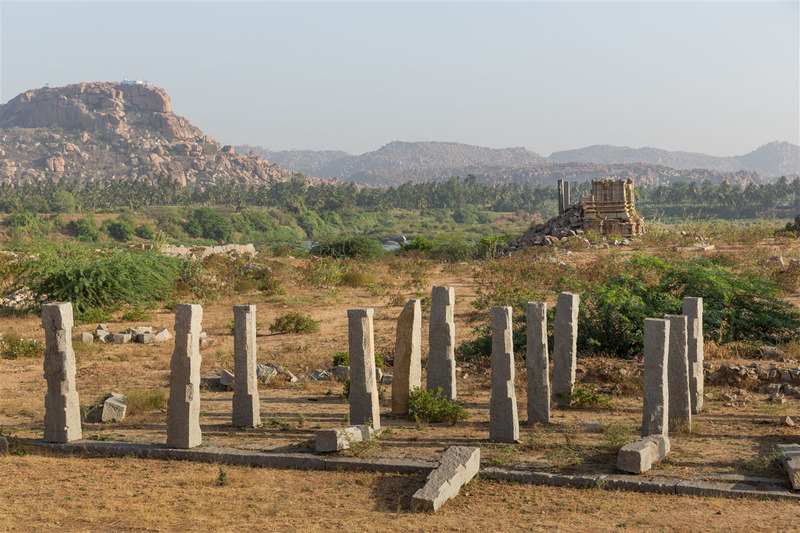 It’s hardly surprising this is the most photographed and visited site in all of Hampi. I was extremely lucky to be allowed in early and to be able to soak it all up in utter peace. 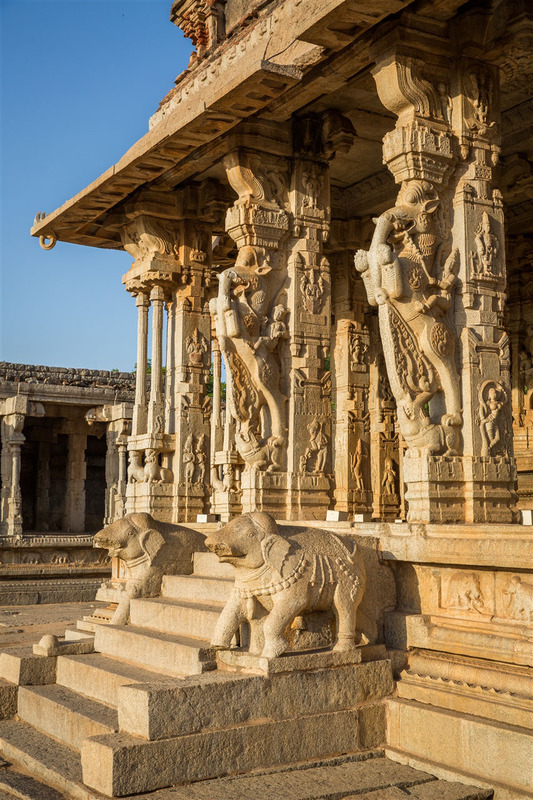 Vitthala Temple is open daily, 8.30am – 5.30pm. Great post, the pictures are beautiful. Makes me want to go there! It’s amazing place to visit. The photographs are awesome as well. 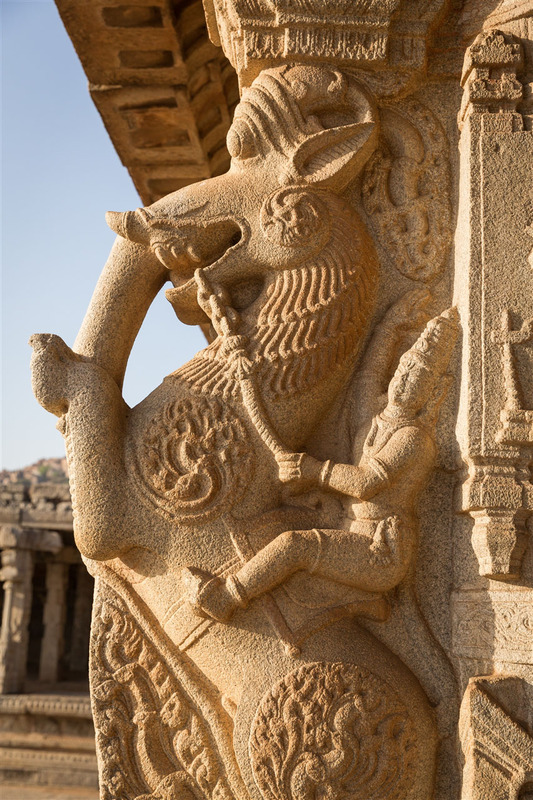 Vijay Vithala temple complex jewel in Hampi monuments. The Photograps and narration is parellel.Thanks a lot. Thanks Girish for your kind comments ! 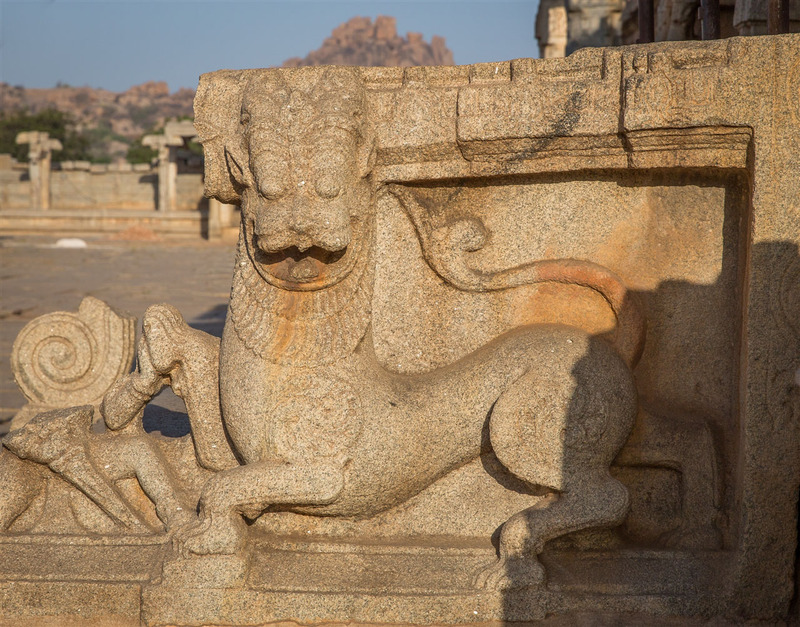 I love Hampi, I need to return there soon! Hello, I am J Khatri, Associate Professor in History at DAV College, Chandigarh. 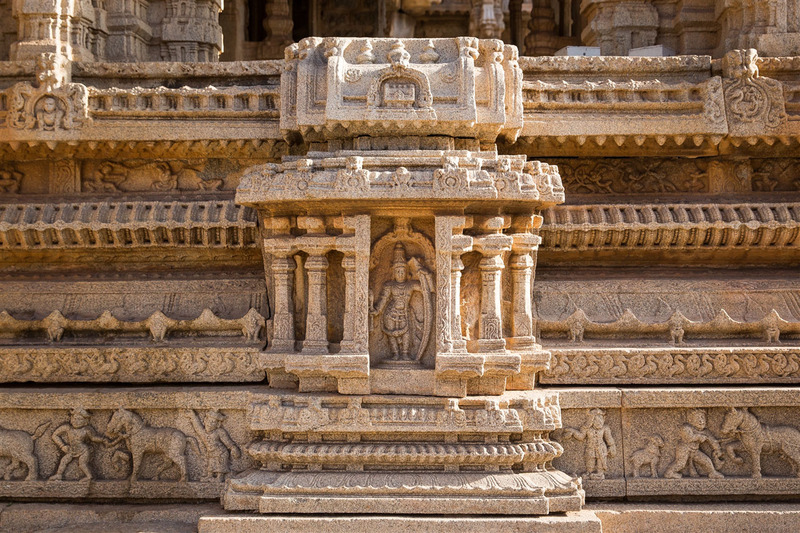 Liked your blog on travel tourism. My dept and the college will be honoured to have you as a guest speaker to interact with the students on the theme: “Travel, Memory and Photography”. In case if you happen to come to Chandigarh or Punjab please get in touch. Namaste Jyotirmaya. Thanks for your kind comments and invitation. 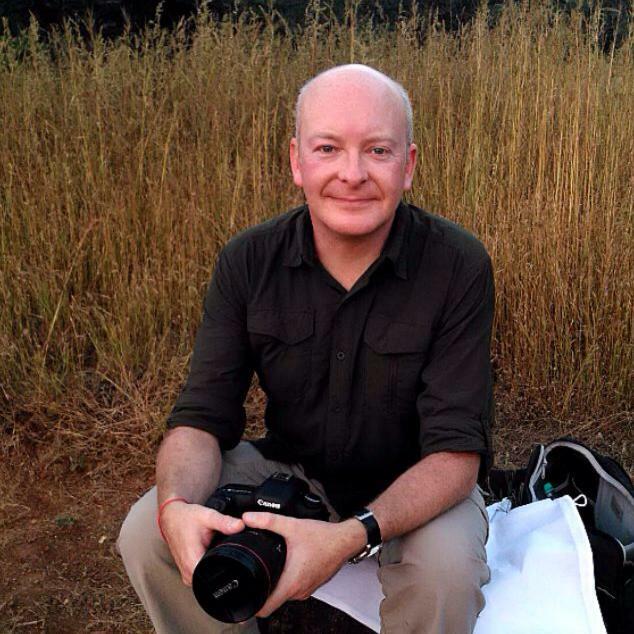 I don’t specifically have any plans to be in the Chandigarh region soon, although I am planning my 20th visit to India at the moment, which will happen in early 2018!